Everybody's reposting the photos from this garden delight wedding. The fairies and the streamers and the picnic at the base of the trees. But I think this detail is my favorite. Flowers by Laurie Cinotto. Photos by Heather Gilson of One Love. i hadn't seen this wedding yet but just browsed the photos and ...wow. i think this detailed photo you posted is my favorite too. You HAVE seen the wedding on S&I where they did the arrangement in the urinal, right? Riiiiggghhhttt? Because it was Kathryn's fav too. there is just something so old and dirty, yet beautiful about it. These images are so wonderfully out-of-the-box gorgeous. Love the imagination and spirit they convey . . .
my favorite too. and not just cuz i don't really use my sink that much. wait urinal where!? i wanna see that. Yes, I've seen the wedding ... but not the sink pic. And I'm with you. Just amazing/unexpected/makes me smile. I just want to smell that sink. Or stick my arms in it. Or bathe. Well this sink looks dirty, but it's quite cool! kinda unique wedding photo. Thanks for sharing. 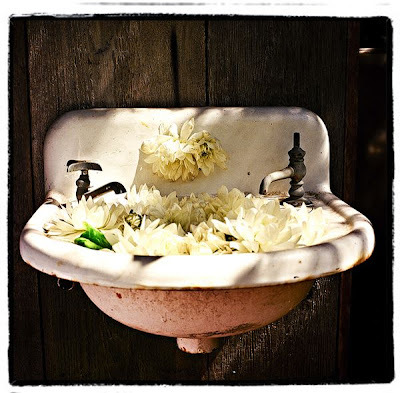 Oh I love it because I was so tickled while walking their property when I spotted this sweet dirty perfect flower sink! For sure my favorite. But the wine glasses with flowers are a close second. Thanks! Oh I love it! Do you think my husband would mind if I ditched the washing up to fill the sink with flowers?! Flora, I think you're on to something! Yee! Sink full of flowers instead of washing! I think this should be a mass movement.